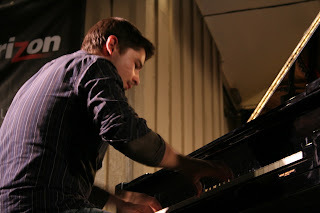 A great jazz festival is a frustrating experience. 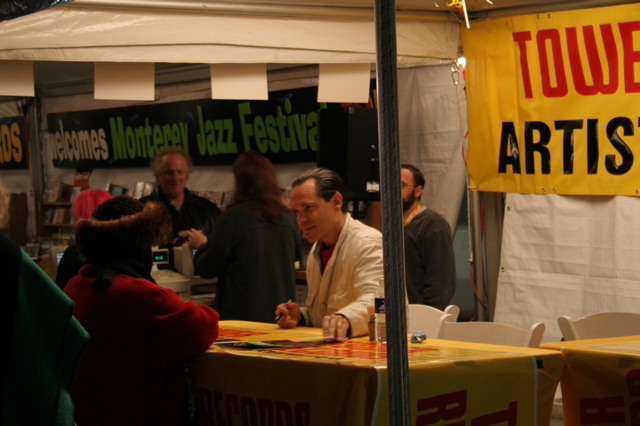 You want to be in several places at once, but ultimately you must choose: the Yellowjackets with Kurt Elling? Or the Robert Glasper Trio, or Roy Hargrove & RH Factor, or up-and-coming singer Sasha Dobson, or young powerhouse pianist Eldar? They all performed at approximately the same time on the opening night of the Monterey Jazz Festival, the longest-running jazz festival in the world. Backed by Sicilian bassist Marco Panascia and Brooklyn-via-Texas drummer Kendrick Scott, the 19-year-old prodigy from Kyrgyzstan continued with an original composition, “Daily Living,” a blend of thundering chords and lightning-fast runs. Eldar exudes strength; if you ever shake his hand in greeting (as we did at the Dakota in Minneapolis when he played there in November 2005), watch out. Yet he’s also capable of sweet delicacy and restraint. We stayed through a bluesy version of Bobby Timmons’s “Moanin’,” whose center belonged to bassist Panascia. At times, Eldar’s playing sounded like piano, twelve hands. The Garden Stage is an ideal place to start your Monterey experience. Like the larger Arena, where the big guns play (Arena tickets sold out months ago), it’s open-air. The combination of live, in-the-moment jazz with salty California breezes and starry skies is intoxicating. People bring in lawn chairs or sit on the benches or bleachers, often on foam cushions they bought at a festival years ago and have carted around ever since. It’s a diverse, relaxed, and enthusiastic crowd of all ages, including snoozing babies in strollers and elegant ladies in fancy hats. At a time when many jazz artists play to sparse houses, it feels good to be surrounded by people who love the music. 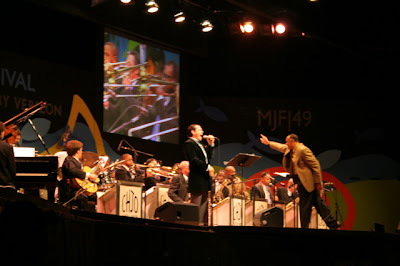 Conductor and bassist John Clayton introduced the band (including 88-year-old trumpeter Snooky Young), explained that it has three leaders (himself, his brother, saxophonist Jeff Clayton, and drummer Jeff Hamilton) “to share the debt” and invited Elling back on stage. Elling began by performing three of the many songs he’s known for: “Close Your Eyes,” “My Foolish Heart,” and “Man in the Air,” co-written by Elling and Hobgood for and about Wayne Shorter. Elling was in superb voice. Surprising for those of us who’ve seen him in concert several times over the years (at the Dakota in Minneapolis, at Birdland in New York, at Chicago’s Orchestra Hall), he has cut off his trademark ponytail and shaved his goatee. With his hair slicked back, impeccably dressed as always, he’s looking sleek and wolfish. He thanked us for staying up late and for “bringing your fleece-lined items.” By now, the night air was more than chilly, and the Arena’s infamous metal folding chairs were icy cold. Elling encouraged us to stuff our sleeves with sawdust (there’s plenty of it on the Arena’s floor; it doubles as an equestrian stadium) and get to know our neighbors. “As promised,” he said,” we have something new.” He and the orchestra premiered a work in progress: “Red Man-Black Man,” which explores connections between African-American and American Indian music. Clayton was inspired to write it when he heard Elling perform at Birdland last January; Elling contributed original lyrics and added poems by Native American poet Maurice Kennedy and African-American poet Gwendolyn Brooks. The “work-in-progress” description fits; I’m not sure “Red Man-Black Man” is entirely successful yet. It seems a little strange to hear Elling sing about being one with the grass and wrestling with the thunder, and at one point the percussion consisted of musicians dropping chains on the stage. But it had some lovely moments and a big finish. Most of the audience seemed to enjoy it and gave it a standing ovation. As people began to leave, Elling and the orchestra treated the rest of us to a lilting, affectionate “Lil’ Darlin’,”with Jon Hendricks’ lyrics bookended by Elling’s own. Earlier, when Elling told the crowd to expect “something new,” a fan shouted “Winelight!” “Come to Dizzy’s Den,” he responded, giving us a hint of what to expect on Saturday night at 8:30…except we’ll probably be at the Arena celebrating the 40th Anniversary of “Forest Flower” with Charles Lloyd and his quartet. Or at the Night Club for the Jeff Hamilton Trio. Or at the Starbucks Coffee House Gallery for Hiromi. It’s so hard to choose.